Enter to win this Rapunzel figure for Disney Infinity! Giveaway: Wreck-It Ralph and Vanellope figures for Disney Infinity! 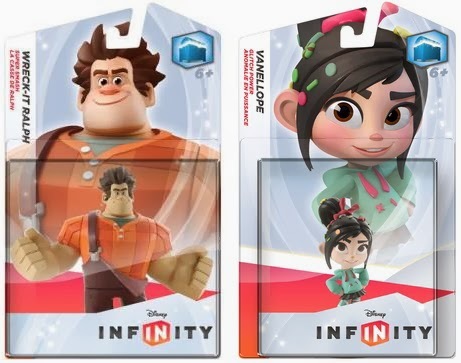 Enter to win Wreck-It Ralph and Vanellope figures for Disney Infinity! Giveaway: Frozen Anna and Elsa Figures for Disney Infinity! 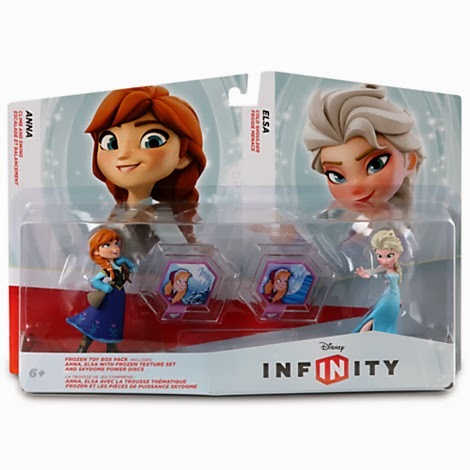 Enter to win these new Frozen Anna and Elsa figures for Disney Infinity! Giveaway: AMC Theatres $25 Gift Card! 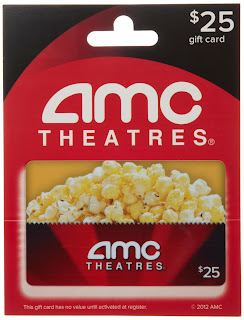 Win a $25 AMC Theatres gift card! 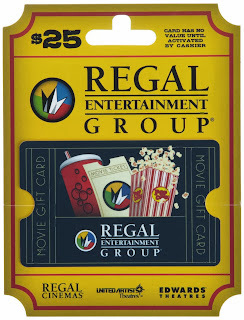 Giveaway: Regal Cinemas $25 Gift Card! 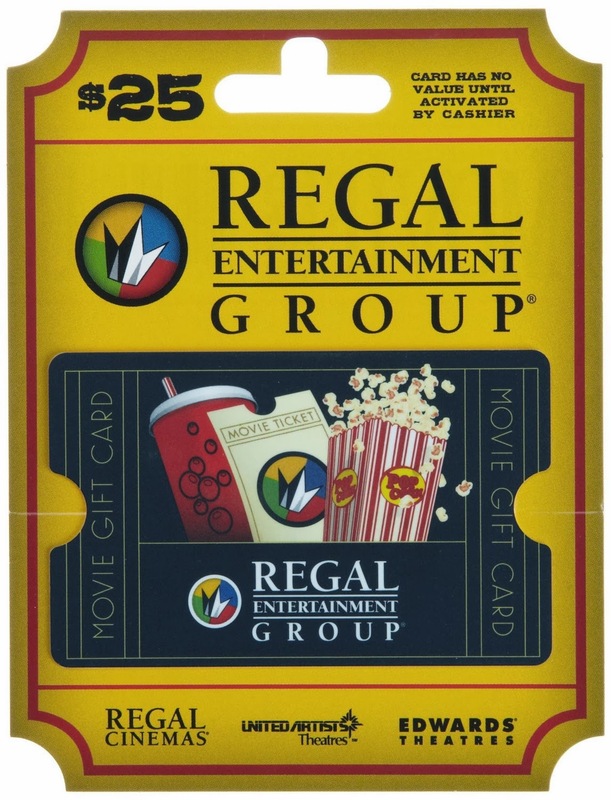 Enter to win a $25 gift cad to Regal Cinemas! 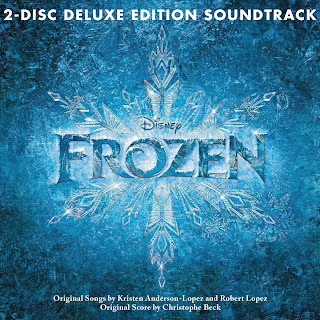 Giveaway: Win One of Five Deluxe Frozen Soundtracks on CD! 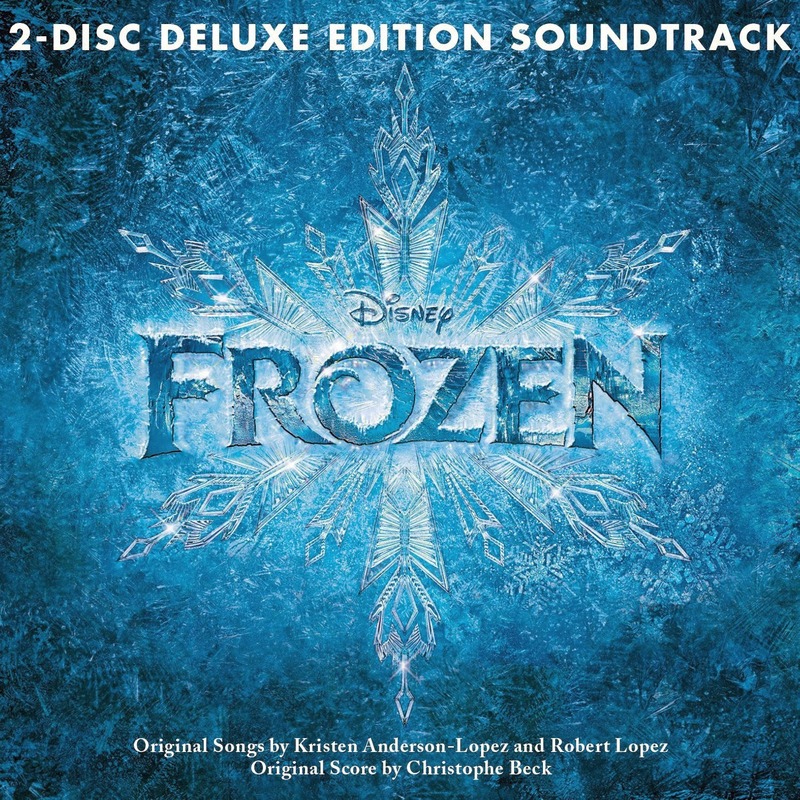 Enter to win one of five deluxe Frozen Soundtracks on CD! 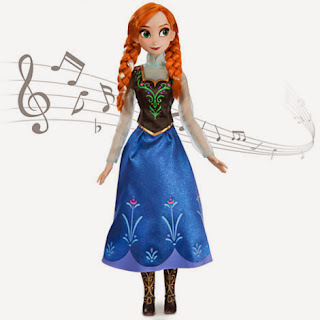 Giveaway: Singing Anna Doll from Disney Frozen! 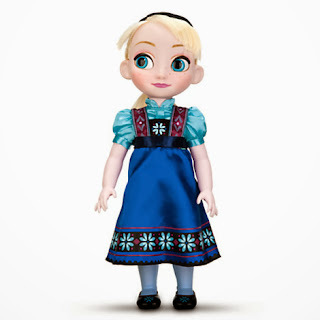 Enter to win this beautiful Singing Anna doll from Disney's Frozen! 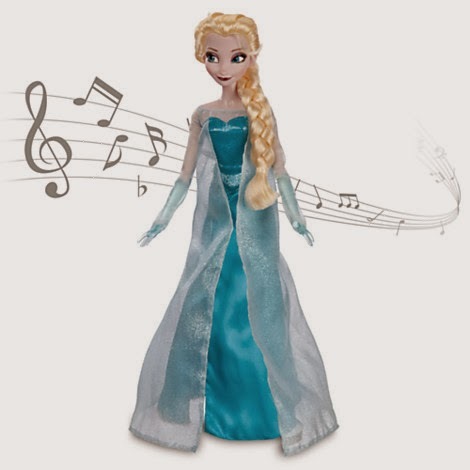 Win this fantastic Singing Elsa Doll from Disney's Frozen! 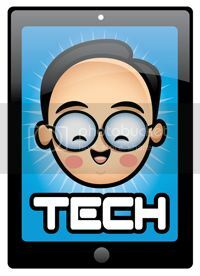 Print the page on regular paper or cardstock and cut out the door hanger. Fold it in half and glue it so the design is now two-sided. Cut the hole where the hanger will slip on to the door handle. Hang whichever side fits your mood! 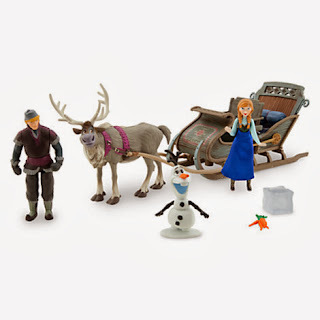 Giveaway: Disney Frozen Deluxe Anna and Elsa Dolls! Win these beautiful Anna and Elsa Deluxe Dolls from Disney's Frozen! Giveaway: Disney Frozen Snow Globe! 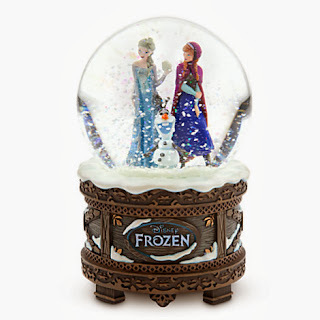 Enter to win this beautiful Frozen Snow Globe! It plays "Let It Go" the powerful song sung in the movie by Broadway great Idina Menzel! Win this massive Castle of Arendelle playset from Disney's Frozen! 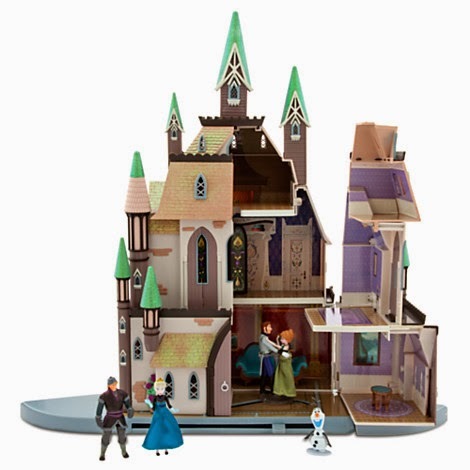 Giveaway: Disney Frozen Sleigh Ride Playset! Enter to win this great sleigh ride playset from Disney's Frozen! 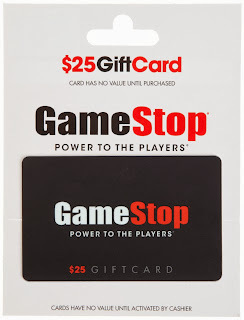 Giveaway: $25 GameStop Gift Card! 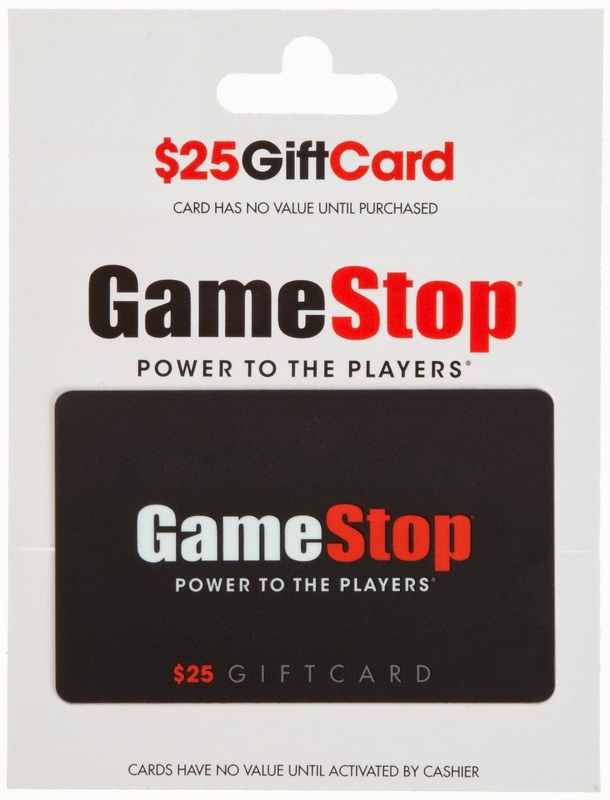 Win a $25 gift card to GameStop! Print and cut out the snowflake templates you would like to use. You can choose a medium snowflake and/or small snowflake template to layer on top of the large snowflake. Trace them onto blue and purple felt. Mix and match your snowflakes alternating the colors. Once your felt snowflakes are all cut out, assemble them with hot glue or craft glue. Add a rhinestone on the very top snowflake. 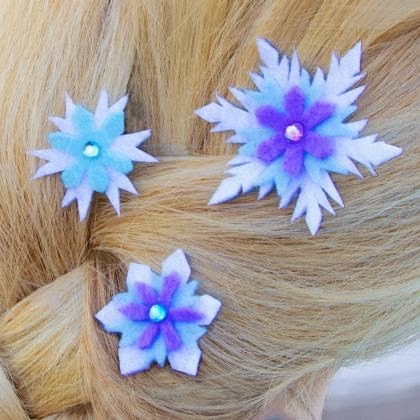 Use hot glue or craft glue to glue them to a bobby pin or barrette of your choice. Allow the glue to fully dry before pinning them to hair. 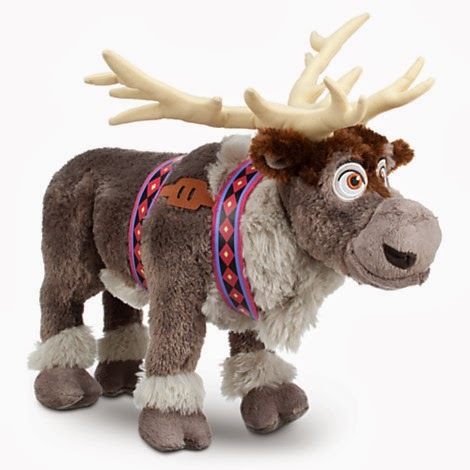 Enter to win this fantastic Sven plush! 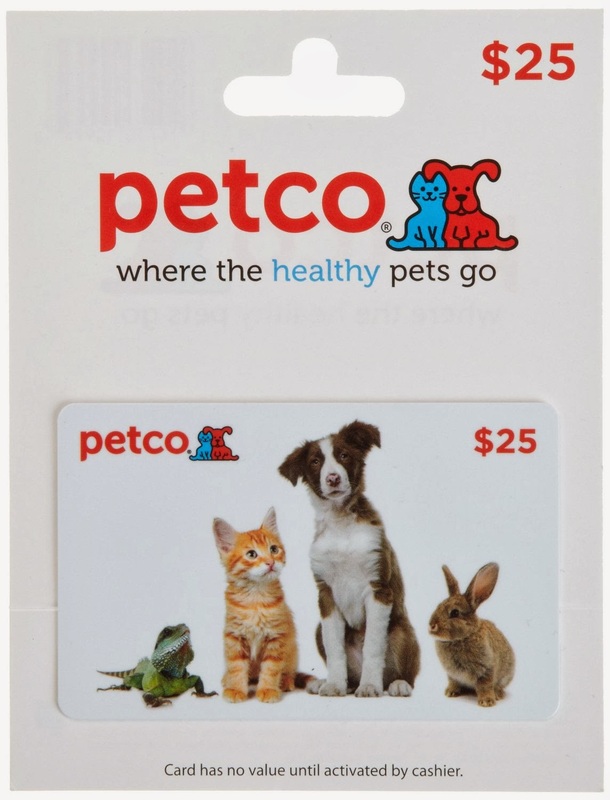 Giveaway: $25 Petco Gift Card! 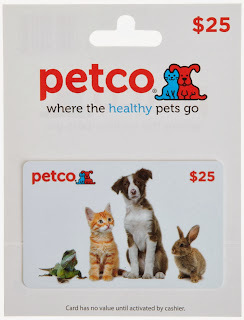 Enter to win a $25 gift card to PetCo! Treat your pet to something nice! Win this awesome Singing Olaf! He talks and sing the fantastic song "In Summer"! 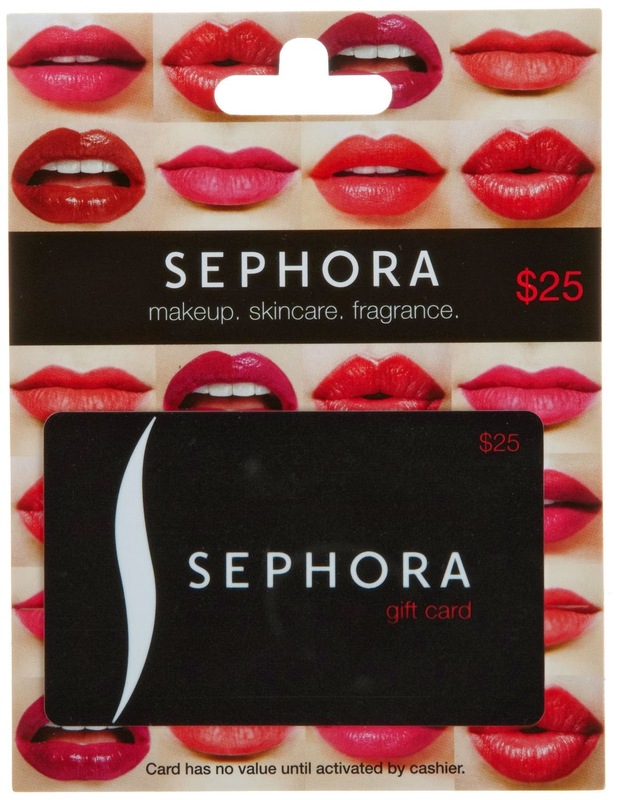 Giveaway: $25 Sephora Gift Card! 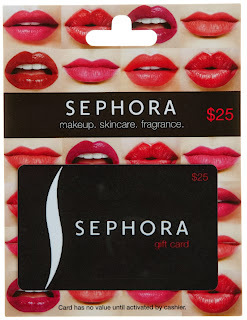 Who can use a $25 gift card to Sephora? What would you buy with it? Savory Thanksgiving Day Cupcake Recipe! 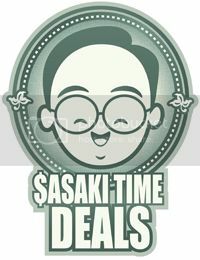 From the newest contributor to Sasaki Time, Brandy will be bringing us unique one-of-a-kind recipes from time to time! Please welcome her to the team and hope you love this awesome recipe Savory Thanksgiving Day Cupcake Recipe! 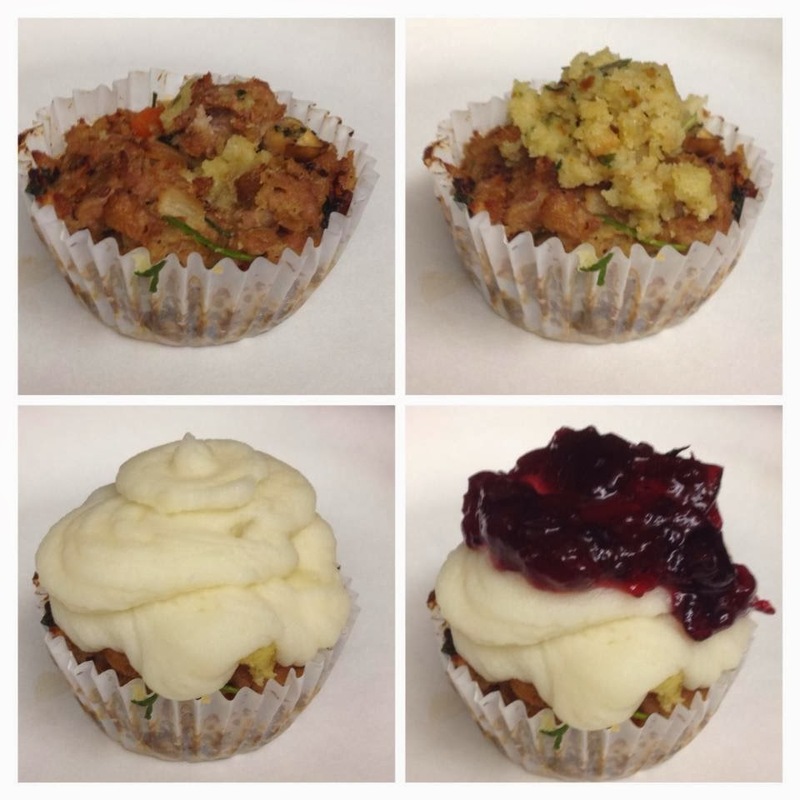 This savory cupcake features turkey meatloaf, filled with stuffing, topped with mashed potatoes and cranberry sauce! 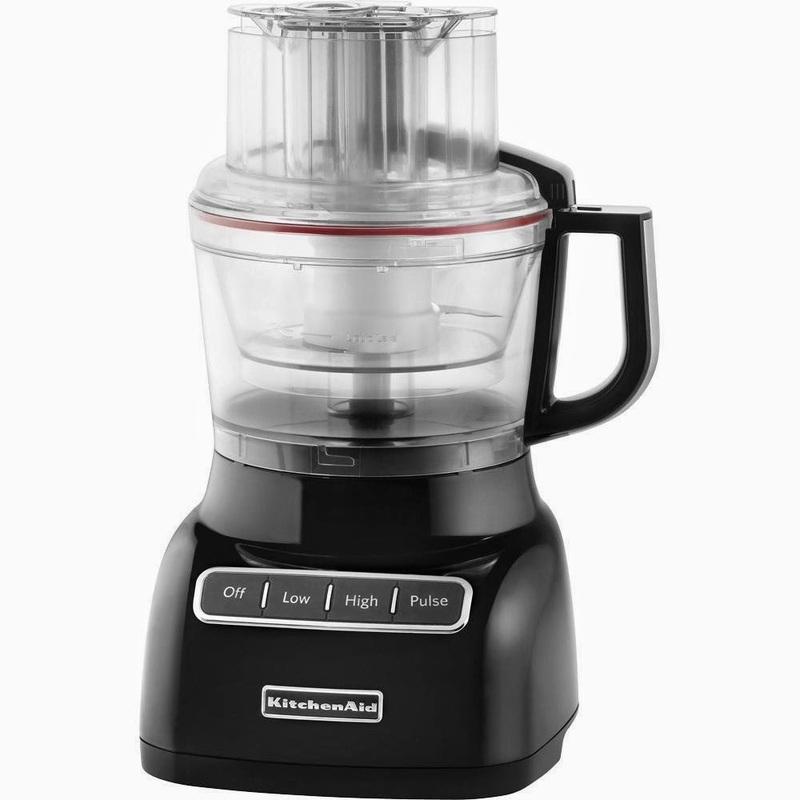 Stir together bread crumbs and milk in a small bowl and let stand while preparing the next step. Cook onion and garlic in oil in a 12-inch nonstick skillet over moderate heat, stirring, until onion is softened, about 2 minutes. Add carrot and cook, stirring, until softened. Add mushrooms, 1/2 teaspoon salt, and 1/4 teaspoon pepper and cook, stirring occasionally, until tender. Stir in Worcestershire sauce and parsley. Remove from heat and allow to cool for a couple of minutes or until its cool enough to touch. Add to your bread crumb mixture your egg, egg white, turkey and remaining 1/2 teaspoon salt and 1/4 teaspoon pepper. Mix with your cooled veggie mixture well with your hands. Using a standard cupcake pan lined with paper or aluminum cupcake liners, divide meat mixture equally into the 12 liners. Make a hole in each mini loaf with the end of a wooden spoon. Bake the cupcakes for about 20 min or until the internal temperature reaches 170°F. While cupcakes are baking make your stuffing and mashed potatoes. I like Stouffers chicken stuffing so that is what I used and I make my mashed potatoes from scratch. After the cupcakes come out of the oven scoop some stuffing into each hole you made before baking. Use a pastry bag to pipe on your prepared mashed potatoes to look like icing, and top with a tablespoon of cranberry sauce. Hint: If you don’t like cranberry sauce, top your mashed potatoes with a pad of butter and some gravy. Arrange all of your ingredients in bowls and plates for easy access. On a flat working surface, such as a cutting board or flat plate, tape a large piece of parchment paper to the surface so it is flat and smooth and will not move while your work. If you are using chocolate kisses for the buttons, use a knife to shave down the sides. Unwrap an orange Starburst and set it on the wrapper. Heat it in the microwave for 7 seconds. Take it out and allow it to cool- 15 seconds or more until it is cool enough to handle. Mold it into the shape of Olaf’s nose using your fingers. Set it aside. Using a knife, splinter a few pretzel sticks to create Olaf’s hair. Heat the white candy melts in a microwave safe bowl on 40% power for 25 seconds at a time until the candy is melted. Stir it and pour or spoon it into the cleaned and dried squeeze bottle. Put the top on the bottle. Squeeze out the white candy onto the parchment paper in the shape of Olaf’s head. You can use the food brush to smooth out the candy. 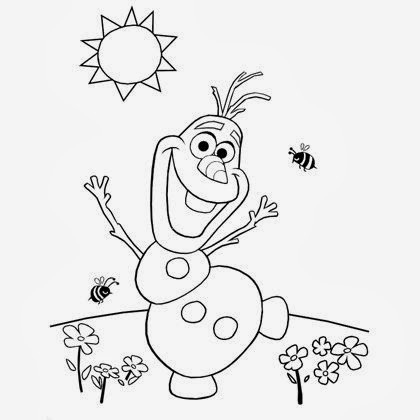 Use the edible blue and black pens to outline Olaf's eyes. Squeeze out a second layer of candy over Olaf’s head, building up the candy near the top. 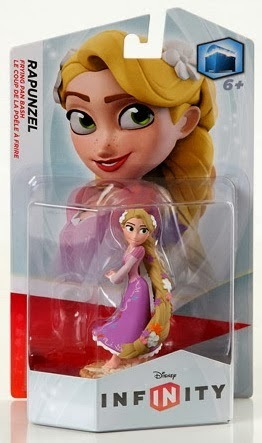 Use the brush to smooth the candy then place 2-3 pretzel slivers for the hair and two candy eyes. Squeeze out more melted candy under the eyes. Place a nose just under and between the eyes. Squeeze out more melted candy around the nose, using the brush to smooth. Allow the candy to fully dry. Melt the chocolate candy melts in a small microwave safe bowl on 40% power for 45 seconds. Stir the candy until smooth. Clean and dry your food brush then use it to paint on Olaf’s mouth using the melted chocolate candy. Allow time to dry. Clean and dry the food brush. Open the squeeze bottle and dip your brush into the white candy. Paint Olaf’s tooth in the top center of the mouth. Allow time to dry. Scoop out two scoops of vanilla ice cream into a small bowl (stacked). Give Olaf three chocolate kiss or chocolate chip buttons and two pretzel stick arms. 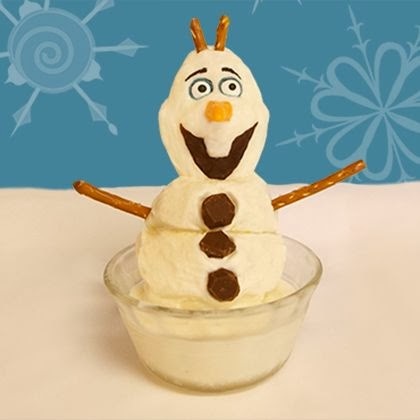 Peal Olaf’s head from the parchment paper and stick it on top of the ice cream. Serve immediately. Giveaway: Disney's Frozen Anna Toddler Doll! 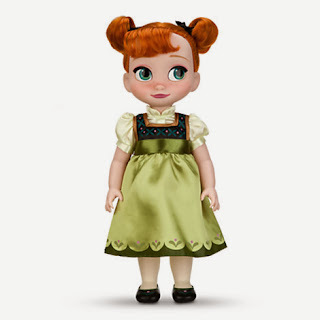 Enter to win this cute Anna Toddler doll from Disney's Frozen! Enter to win this cute Elsa doll when she was a toddler in the upcoming Disney animated film Frozen! 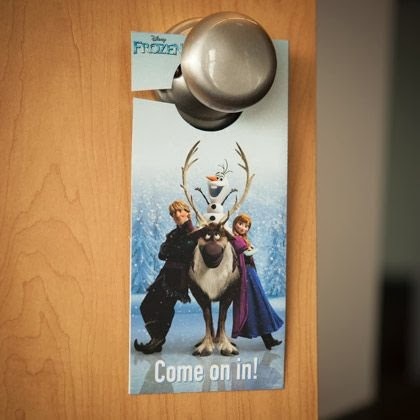 Frozen opens nationwide on November 27th! Blu-Ray Review: Disney Planes Blu-Ray Combo Pack! What happens when you explore the world above the world of Cars? 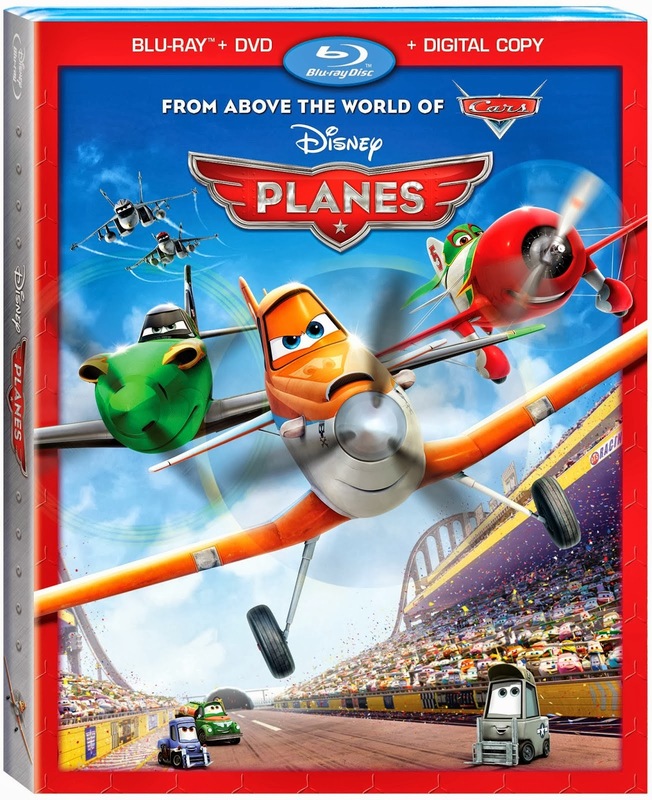 You get Planes! The newest movie from DisneyToon Studios! We are introduced to Dusty Crophopper who dreams of racing and gets his chance to participate in one of the greatest races in the world! But Dusty isn't really built for speed and he is also afraid of heights. Along the way he is supported by his friends, gets mentored by an old war plane and makes some new friends. They all help Dusty find the courage to overcome the odds. The video quality is what you have come to expect from a Disney blu-ray! Crisp and vibrant colors combined with amazing detail! You can see all the textures that provides for a more lifelike experience! Some great wind effects that come off of each plane adds to the sense of flight! You would be hard pressed to know that this spin-off is not made by the folks in Emeryville! 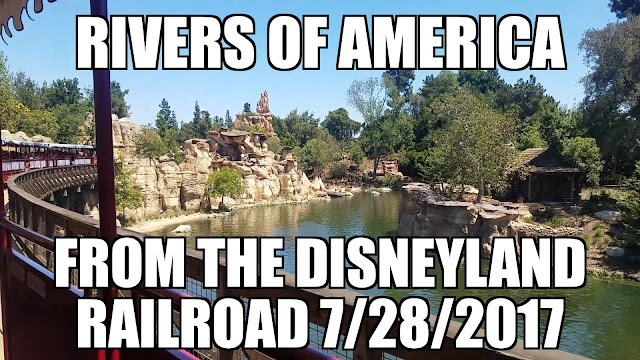 The audio is also up Disney's high standards of quality! The dialogue is perfectly clear! The sounds of the planes really bring you into the racing experience! The rear channels are just as active as the front channels here! With planes flying all over the sound field, you feel as if you are in the middle of all the races! Exclusive Musical Scene: Franz's Song (HD, 3 minutes): Director Klay Hall and producer Traci Balthazor-Flynn introduce a finished deleted sequence that features the tiny Franz that was cut a t the last minute. 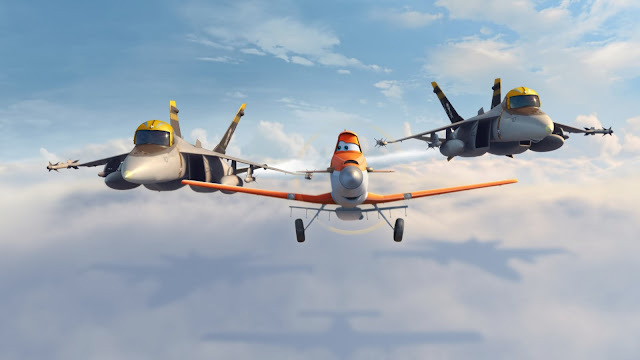 Klay's Flight Plan (HD, 16 minutes): This feature showcases Hall's love of airplanes and his personal connection to the film, which he shares with his two sons while taking a look at some of the planes that inspired some of the film's characters. Deleted Scenes (HD, 8 minutes): Two unfinished deleted scenes are shown here: a training montage and a Taj Mahal sequence that was reworked. Meet the Racers (HD, 7 minutes): You get to meet four of the racing planes in the movie: El Chu, Ripslinger, Dusty and Ishani. Top 10 Fliers (HD, 6 minutes): Quickly learn about the top ten real-life fliers of all time. A film, that while borrowing heavily from the first Cars film, is still very entertaining. The video and audio presentations are top notch here! The supplements are few but for a film that was suppose to be a direct-to-video only, they aren't bad. A good Holiday gift for your kids! 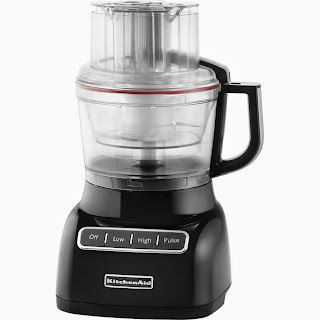 Win this KitchenAid Food Processor by entering today! Giveaway: Hamilton Beach 6-quart slow cooker! 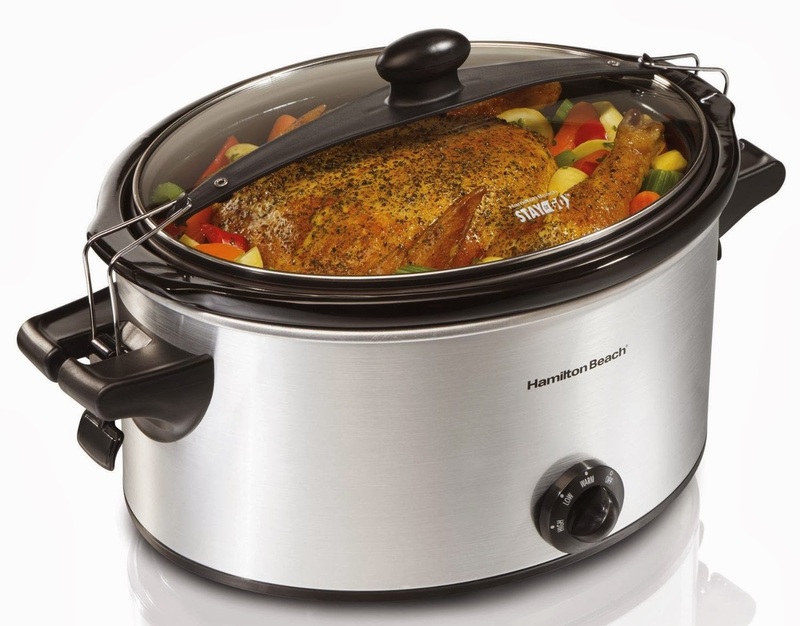 Enter to win this fantastic Hamilton Beach 6-quart slow cooker! 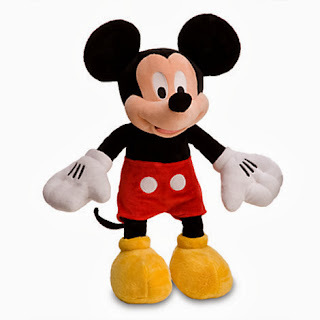 Giveaway: Mickey Mouse Waffle Maker! 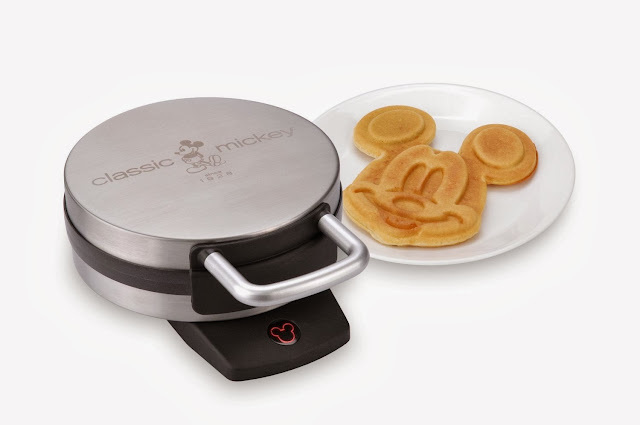 Make classic Mickey Mouse waffles everyday with your new Mickey Mouse Waffle Maker! 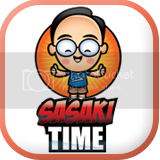 The Wind Rises arrives in limited US theaters February 21, 2014 and expands on February 28, 2014. 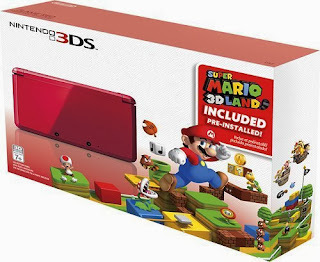 Enter to win this Red Nintendo 3DS Holiday Bundle with Super Mario 3D Land pre-installed! Enter to win a Kindle PaperWhite! 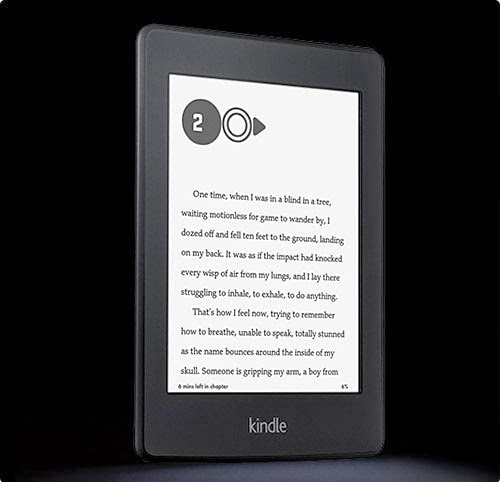 What a great way to keep your entire library of books with you anywhere you go! Giveaway: Mickey Mouse Ornament Set! 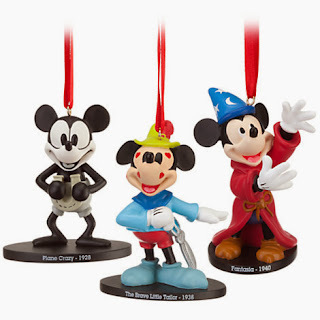 Celebrate Mickey's birthday by entering to win this awesome ornament set! 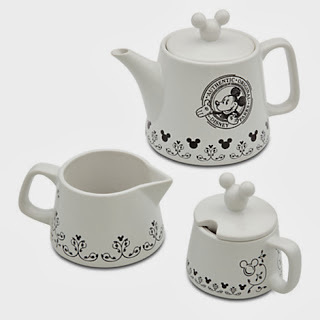 Giveaway: Mickey Mouse Tea Set! Celebrate Mickey's birthday by entering for a chance to win this great tea set! Celebrate Mickey Mouse's birthday by entering to win this awesome 18" plush! Giveaway: Agents of SHIELD Logo shirt! Giveaway: Agents of SHIELD grey logo shirt! Giveaway: PS Vita and The Walking Dead Bundle! Giveaway: $25 Gift Card to Buffalo Wild Wings! Giveaway: TGI Friday's $25 Gift Card! Giveaway: IHOP $25 Gift Card! Poster for The Wind Rises! Miyazaki's Final Film! 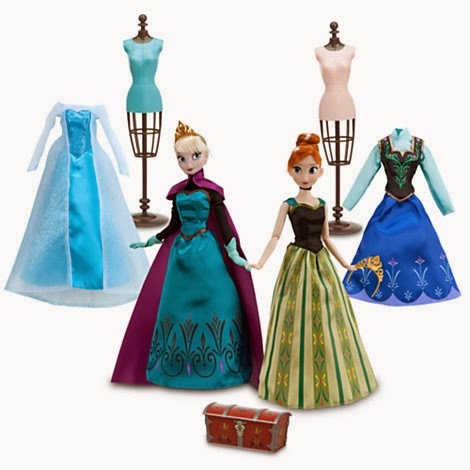 Giveaway: Anna and Elsa Doll Set from Frozen! 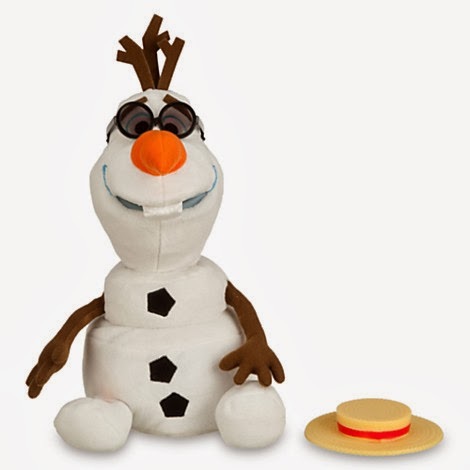 Giveaway: Olaf 18" Plush from Frozen! 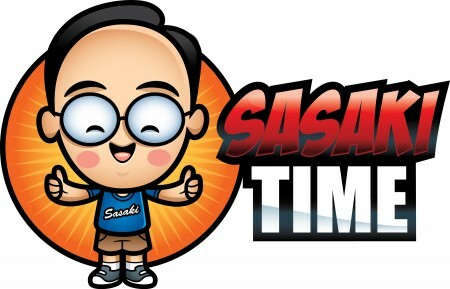 Movie Review: Thor: The Dark World! Thor: The Dark World Premiere Photos! Giveaway: PS3 500GB Grand Theft Auto 5 Bundle! Giveaway: XBOX 360 250GB + Kinect Holiday Bundle! Delivery Man - Premiere Photos! Delivery Man - Featurette "Guardian Angel"
Giveaway: Olive Garden $50 Gift Card! Giveaway: Jamba Juice Gift Card!